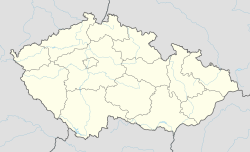 Studénka (Czech pronunciation: [ˈstudɛːŋka]; German: Stauding) is a town of 9,643 residents in Nový Jičín District of the Moravian-Silesian Region, Czech Republic. It is on the mainline railway between Kraków and Prague, and was the scene of the Studénka train disaster 2008 and Studénka train disaster 2015. The town is situated on both sides of the historical border between Moravia and Silesia. It became best known as the birthplace of František Tomášek. Butovice (Botenwald) - formerly a Moravian village, during communism the area was exploited for the agricultural industry. Wikimedia Commons has media related to Studénka. This Moravian-Silesian Region location article is a stub. You can help Wikipedia by expanding it. This page was last edited on 7 November 2018, at 16:03 (UTC).